The Nokia C5-03 smartphone, allows you to access Ovi services,both high-speed cellular and Wi-Fi connectivity at a very affordable price. 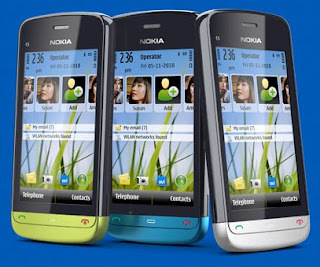 A touch screen smartphone available in graphite and lime green colors.Nokia C5-03 comes with free Ovi Maps and voice guided navigation works on almost 80 countries. According to Benoit Nalin, GM of Nokia Philippines.”It’s a great looking touch device that delivers excellent value for teenagers who are keen on social networking, as well as to individuals who perennially lose their way around the city” . -The home screen is customizable with quick access to contacts,email, and the wealth apps from Ovi. -Can easily setup mail with the free mail account provided by Nokia, Yahoo mail and Windows live Hotmail. Guys, this phone is perfect with travelers and to those active in social networking activities! For detailed specs read more here. A courtesy video from Nokia.